With the launch of the first ever official FreePBX ISO installer disk I thought I would take a few moments to explain what you may find different from other installers you may have used before and make sure everyone understands how to install and get into their new PBX. For those who do not know who I am. My name is Tony Lewis and I am one of the Developers involved in the FreePBX Project. Even though I do not write much code I am the main go to guy for bug testing and support management. I am also one of the owners of Schmooze Com, Inc. who’s company is a major sponsor of the FreePBX project. 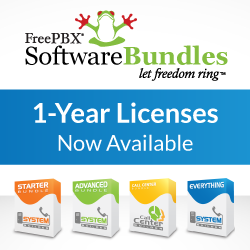 We also manage all the FreePBX paid support. You probably already know Moshe, aka mbrevda, and Bryan, aka GameGamer43 on the IRC channel who are both also with Schmooze. We basically sells turn key FreePBX hosted and premise based systems with a ton of features built on top of normal FreePBX through a reseller channel. Some of these cool features will start becoming available in a new soon to be launched FreePBX Store and download-able through the new Commercial Repo in FreePBX but more on that another day. The first thing you will notice when downloading and installing the FreePBX Distro is the ISO is a small disk about 18MB known as a netinstaller. Once your boot off the drive it will ask you to setup the network interface to get to the Internet and once done, the fun begins. A handful of setup questions and your system install is on the way. We’ve tried to keep things simple with functionality such as automatically setting up a software RAID pair of disks if two are detected (with no hardware raid card present). This is a lot different then you may have encountered before. We have tried to design this “out of box experience” (OBE) to avoid any default passwords floating around on the internet adding yet another aid to all those hackers out there trying to break into systems! For those passwords that you don’t see like the database or AMI credentials, those were already handled during the installation process and populated with randomly generated values! All of this, along with several changes in FreePBX 2.9 reflect the constant effort that we have been trying to put into further securing your systems based on the constant feedback that we hear and listen to. Don’t worry about that email address listed there, that’s just what FreePBX uses to tell you about new updates, and that address resides on your system alone, it never gets transmitted anywhere! Once inside you will see the normal FreePBX interface and everything in one unified spot. If you click on the tool tab and look for a module called System Admin you will find a few cool things. The System Admin module is not a standard FreePBX module and allows you to manage numerous Linux sysadmin items but in an abstracted way to make sure we are not giving the FreePBX apache user access to any root commands such as changing network settings and other normal root user only options. This is another example of the security minded approach that we are trying to take, as there have been major breaches in the past when hackers have found ways to exploit the elevated privilege that sudo root access to the web application can provide. [*] Storage- Will show you basic hard drive usage and let you setup a email to get notified of hard drives becoming full and if using software raid notifications of a raid failure. [*] Time Zone- To change the system timezone and force rsync with some ntp servers. [*] License- This will be used at a later point to pull down a license file from the FreePBX store for paid commercial add on modules that Schmooze will be offering or anyone else who wishes to add commercial FreePBX style modules for sale through the upcoming FreePBX Distro Commercial store. We are looking forward to the further exposure and feedback that we will receive once all of you start to take a look at the new Distro and are extremely excited to start working with the community to provide a great full featured product!